The orphan drug tax credit is simply an incentive for pharmaceutical companies to develop treatments and cures for ‘rare diseases’ that affect Americans citizens. What constitutes a ‘rare disease’? So here is where the wheels come off the bus a bit: Everyone has their own definition. And this has major implications as we shall see below. The World Health Organisation considers at least 5,000 diseases and syndromes as ‘rare’, while different American organisations count between 1,109 diseases – by the National Organization for Rare Disorders (NORD) – to 2,117 diseases – at the Office of Rare Diseases (ORD) of the National Institute of Health – as ‘rare’. The French definition used at Orphanet is very similar to the WHO with a list of approximately 5,000 conditions, while Japanese law considers ‘rare’ as a condition that affects less than 50,000 people in Japan. At the US Food and Drug Administration (FDA), the Office of Orphan Products Development (OOPD) considers a rare disease/disorder to be one that affects “fewer than 200,000 people in the U.S., or that affect more than 200,000 persons but are not expected to recover the costs of developing and marketing a treatment drug”. Basically, a rare disease is one that affects a tiny fraction of the overall population. Such a small fraction that it is not economical for Pharmaceutical companies to develop new treatments for the affected individuals under normal market-driven economics. While the tiny fraction of people in the general population affected by a particular rare disease may seem small, when you pool all of the conditions together, a sizeable chunk of the overall population is affected. As many as 300 million people worldwide may be living with a rare disease (Source). What does the orphan drug tax credit involve? The tax credit means that a drug company can claim back – from the US government – 50% of all the “qualified clinical testing expenses” that a biotech/pharmaceutical company incurs in a given tax year on the development of a drug that the FDA has designated eligible as an orphan drug. If a drug is considered eligible, these expenses can include staff salaries or the cost of clinical trials (Click here to read more on this). According to the FDA, an orphan drug is defined as a treatment for a condition that affects fewer than 200,000 US residents (although this seems to be a rather flexible definition). 80% of rare diseases have a genetic component, and the majority affect children. So what is the problem with the orphan drug tax credit? Tax Revenue: The US Treasury Department estimates the tax credit will cost the federal government approximately $2.3 billion in 2017 and that number is expected to rise to nearly $2.8 billion in 2018 (Source). And the program will probably cost a total of $75 billion between 2018 to 2027. “A billion here and a billion there, and suddenly you are talking about real money” as the saying goes. Industry transparency: A major critique of the program is that the pharmaceutical industry is fully taking advantage of it. They are getting experimental drugs designated ‘orphan’ status when they really should not be, saving money on the development (at the cost of the tax payer), and then charging the health system extortionate amounts for the drugs once they are approved by the FDA (for example, Glycerol phenylbutyrate or ‘Ravicti’ – from Horizon Pharma – is a genuine orphan drug approved for urea cycle disorders (1 in 8500 births) by the FDA in 2013, which currently costs $793,000 per year (Source)). And sales of orphan drugs hit $36.1 billion in 2016 (Source). 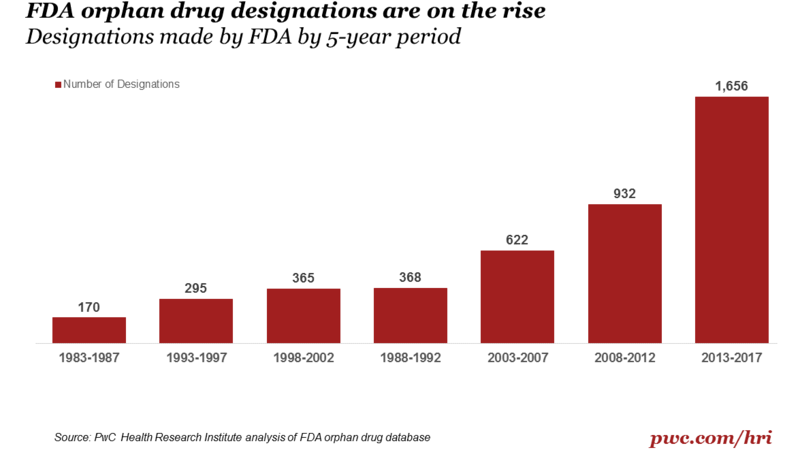 As the graph above suggests, orphan drug designations have been increasing steadily in recent years. From 2013 to date, the FDA has granted 1,656 orphan drug designations – a 78% increase on the previous 5 years. Some may say that this represents the growing success of the program, but others view this trend as industrial abuse of the system. For example, of the 600+ orphan drugs that have won FDA approval for clinical use since 1983, more than 70 of those drugs were already approved by the FDA for more common conditions (including the cholesterol drug Crestor and rheumatoid arthritis drug Humira). But what happens if the orphan drug tax credit is eliminated? Well, while the house of representatives is seeking to remove the orphan drug tax credit, the more sober Senate is apparently looking at reforming rather than removing it. This does not mean that we are out of the woods though. Everything in the bill is up for negotiation I guess, and reforms could still mean severe restrictions. If the orphan drug tax credit was to be eliminated though, there would be consequences. The National Organisation for Rare Disorders suggested in a statement, that there would be 33% fewer orphan drugs being taken to market if the tax credit is eliminated. And they called it “an unprecedented decrease in the development of these life-improving therapies.” They and other advocates for people with rare diseases have sent hundreds of letters to Congress trying to stop the removal of the credit. In addition, the Biotechnology Innovation Organisation, which is a trade group representing the industry, along with large drug companies (including Novo Nordisk, Horizon and Sanofi), is lobbying Congress to keep the credit in the new tax reforms (obviously for the sake of the folks affected by these rare diseases, right?). In short, there would be less incentives for the pharmaceutical industry to tackle rare diseases, ergo: fewer new rare disease treatments. Could they simply reform the orphan drug tax credit system? The Senate seems to think that this is the best idea. And there have been numerous reports citing reforms or restriction of the orphan drug tax credits program (Click here to read an example). This last summer, the FDA itself announced that it planned to overhaul how it handles orphan drugs. This move appears to be designed to eliminate a backlog in applications for drugs requesting rare disease status, which may not help with the larger situation (it may even further aggravate the folks who are suggesting abuse of the program). Reform would be the better way forward. But what does any of this actually have to do with Parkinson’s? It’s not really a rare disease. No, but some drugs being oriented towards Parkinson’s associated conditions like L-dopa induced dyskinesias have been given orphan designations (Click here, here and here for examples). So the Parkinson’s community has benefited from this program – the orphan drug tax credit has helped to support the development of drugs that may not have been taken to the clinic. But there is also great future potential in this program for the Parkinson’s community. Parkinson’s disease is considered a ‘Parkinsonism’. Parkinsonism is a ‘syndrome’ or a set of conditions that are characterised by a set of shared symptoms (for example, rigidity and slowness of movement). And there are efforts currently underway to try and have these rarer versions of Parkinsonisms considered rare diseases (a good example is the efforts of Spotlight YOPD to have different forms of Young Onset Parkinson’s Disease designated as rare diseases). In this way they would then benefit from a program like the orphan tax credit and drug companies would be encouraged to focus their attention on them. The logic behind this effort is further supported by the fact that if a particular drug works in the Juvenile form of Parkinson’s, it may also work for some people with more common late onset idiopathic Parkinson’s. But Simon this is simply gaming the system. This is wasting my tax payer dollars. Why shouldn’t be remove this tax credit? Another view is to finally look upon the subsets of Parkinsonisms as individual conditions that simply share common clinical features (as we do with the 5 different types of Hepatitis – A, B, C, D, & E, and possibly even G – seriously, what happened to Hepatitis F???). By separating the different forms of Parkinsonisms into specifically defined conditions, we could target and develop therapies that would better treat the folks affected by each of those condition, thus reducing the long term societal costs of treating these individuals with standard treatments – that do little but cover up the clinical features of the condition – over the long term. If you live in the USA, you should contact your local congressman and share your thoughts on the proposed tax bill changes. You can find your representatives by click here. And for those of us living in the European Union (for a little while longer at least), we can encourage EU efforts to build an orphan drug system by contacting our local representatives and expressing our support for the idea. Click here to find your local representation. Yann Le Cam is the Chief Executive Officer of European Organisation for Rare Diseases (or EURORDIS) – a non-governmental patient-driven alliance of organisations and individuals active in the field of rare diseases, that promotes research on rare diseases and commercial development of orphan drugs. What if the legislation goes through? It is said that nature abhors a vacuum. And I suspect market forces probably do too. If the legislation was to be passed by the folks on capital hill, I suspect that there would be a major advantage to be had by the European Union or China to setting up their own orphan drug tax credit system and encouraging large pharmaceutical/small biotech companies to set up shop in their backyards. The loss in tax revenue would hopefully be partly made up for by jobs and productivity in the research and clinical trial areas of the economy. 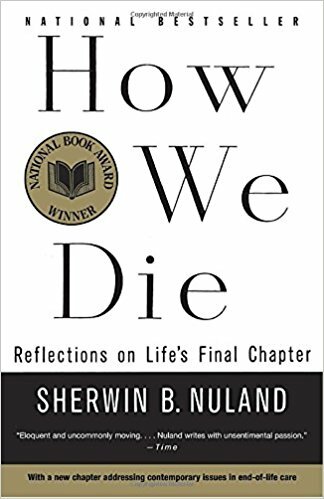 One of my favourite books is “How we die” by Sherwin Nuland. Ignore the depressing connotations of the title. It is a poetic set of reflections from a medical doctor who has sent his entire life watching ‘life’s final chapter’. There is wisdom and beauty on every page, but my favourite part of the book is chapter 11. Throughout the book, Nuland makes an argument for returning some dignity to our last days – rather than prolonging suffering only in order to prolong life, let nature simply take its course he argues. But all of this changes in chapter 11 where he describes the moment he found out that his brother Harvey had cancer. Darwin didn’t teach us evolution. Jean-Baptiste Lamarck can claim that. Nor did Darwin come up with “Survival of the fittest”. That classic belongs to Herbert Spencer. No, what Darwin taught us is the importance of context. Everything changes with context. People can sit at home in their cosy, comfortable lives and think that the orphan drug tax credit is a waste of tax payers money… right up until the point that a loved one is suddenly affected by a rare condition. And then, suddenly, the tables are turned and attitudes change. Without the orphan drug tax credit a lot of rare diseases would never have gained valuable treatments that improve the quality of life for sufferers. 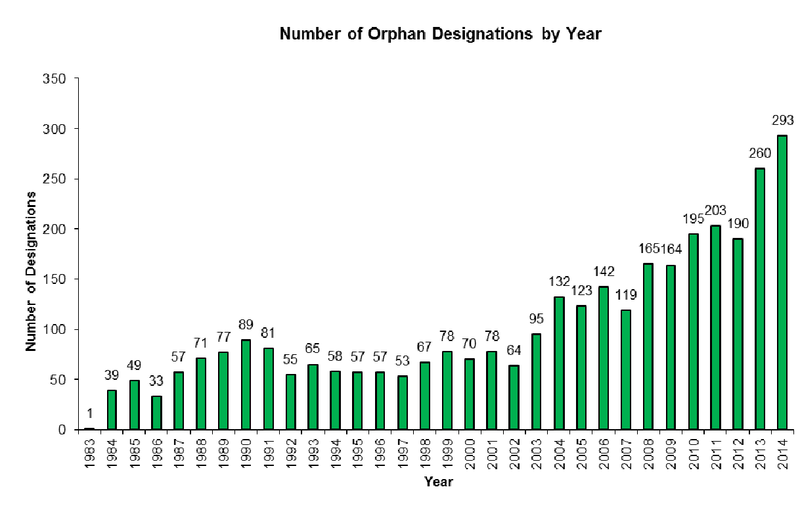 The FDA has approved 647 drugs it designated ‘orphan’ since 1983. This represents a wondrous achievement not only of man’s ability to solve complicated problems, but also our readiness to look out for our fellow citizen befallen by ill luck. For more than three decades, pharmaceutical companies have been able to claim a 50% tax credit on the costs associated with developing new treatments for rare diseases. And yes, some of those companies have taken advantage of the system. But this is not a excuse to abandon the system completely in order to save money. It is a reason to propose reforms that improve the system overall. President Trump and Capital hill have indicated that they would like to move quickly on this tax reform bill, so we will possibly see things happen before the end of the year. I am sitting here hoping that wisdom and prudence will win the day, and the orphan drug tax credit will be left in place, but flagged for reforming. Ok, that’s enough of a rant from me – back to more research based material in the next post. Well, tonight the Senate passed their version of the Tax plan by a vote of 51-49. The House of Representatives version of the tax bill – passed on the 16th November – eliminated the orphan drug tax credit completely, but sources to the media have suggested that senate leadership will resist removing the provision entirely. The senate’s version of the Tax plan will keep the Orphan Drug Tax Credit in place, but with significant changes. After much negotiations, the Senate settled on reducing the credit to 27.5% of the costs of clinical research, compared with the current 50%. They also inserted a provision that would have eliminated any credits for repurposing a mass-market drug as an orphan. The latter change is understandable. Clinically approved mass-market drugs can be used off-label and there is much opportunity for abusing of the system. But the reduction of the credit to just 27.5% of costs is both strange and disappointing. Strange because it is an odd number (literally and figuratively), and disappointing because it will reduce the number of drugs being developed for rare conditions. Until the final bill is placed before President Trump, anything can happen. But this recent decision by the Senate does not bode well. Now we wait to see what the final bill looks like. So you’re saying that this removal of orphan drug tax credit will impact R&D on new pharma-offerings for PD, and that will affect YOPD more because of the variability in parkinsonisms that occur in young-onset. I too love Sherwin Nuland’s book – it should be in all college curriculum IMHO! Nuland’s book should be mandatory reading for all medical students at the very least. Sorry to hear about your situation. Behcet’s is a new condition for me – I had never heard of it. I hope the available medication is helping. With regards to Parkinson’s, I am on a bit of a personal mission (which I will be addressing in an upcoming post) to have YOPD registered as a rare disease. #1. It is rare, and #2. Twin studies suggest that it is largely genetic. Now, by getting rare disease designation (if the orphan drug tax credit is left in tact), drug companies would be incentivised to focus on developing drugs for YOPD. Such trials would be smaller, quicker and easier to conduct. And ultimately any drugs that work in YOPD, could then be repurposed and tested on older onset PD (or other conditions). Thanks for the clarity, Simon. It is with a sense of fearful anticipation I await your next post then. I’m alarmed but not altogether surprised that our increasing DNA mutations are to blame for the rise of genetic-induced YOPD. It answers a lot of questions – rather, you do! Behcet’s (for me) is all about pain; the meningitis can mess with basic understanding & memory for weeks. Could be worse – I don’t have Parkinson’s, but I’ve clearly missed out on these twin studies!